Chefs always want the best ingredients. That starts with the mixer. 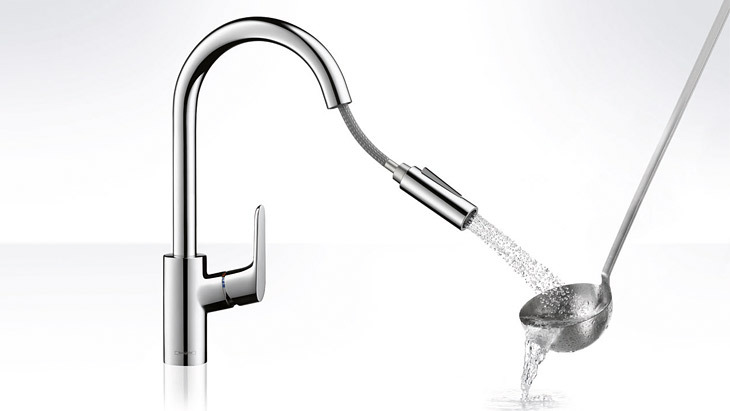 Kitchen mixers from Hansgrohe's Focus range have style. And substance, since they offer functional solutions for any kitchen environment. Convenient: even the basic variants have a high spout and a long handle. With Focus, Hansgrohe is also bringing a kitchen mixer with 2-jet hand spray onto the market for price-conscious consumers. For you this means fantastic sales opportunities. This is the perfect solution for chefs who require plenty of space. In addition to the standard models, there are also Focus kitchen mixers with 2-jet hand spray or single-jet pull-out spout. Show your customers the three ranges Focus, Focus E and Focus S. All the single lever kitchen mixers guarantee ultimate convenience at the sink unit: with individual swivel ranges of 110°, 150° and even 360°. High-quality design and a wide range of functions at an attractive price: the Focus, Focus E and Focus S ranges can fulfil all aesthetic and practical requirements. Focus increases the options for creative diversity in the kitchen. The mixers offer a wide range of combination options and are ideal for modern kitchens with clear, straight-lined furnishings. Available in various finishes – in chrome or an elegant stainless steel look. To match the colours of stoves, refrigerators, extractor hoods or handles. Pull-out spout or pull-out spray head with two jet types: the flexible mixer extensions send the water exactly where it needs to go. Focus models with high swivel spout can swivel up to 360°. Supreme ease of use thanks to the ergonomic handle and variable handle positioning. Your customers tell you whether they would like to have the right or left-handed variant installed. Chefs need space. We call this the ComfortZone. The high spouts are little miracles of convenience, and they create space between mixer and sink. Your customers can now have their shower fun in the kitchen too: with different jet types that can be changed at the touch of a button. Whether you are dealing with vegetables, salad, fish or meat: the ample-sized shower spray will clean and rinse everything thoroughly. The Normal spray fills up containers quickly and with perfect aim.